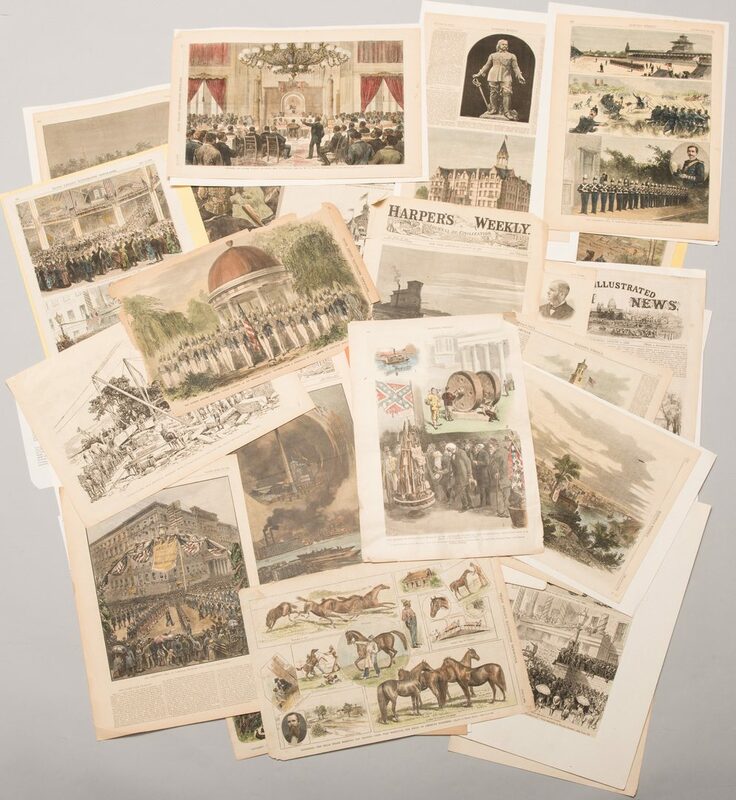 Assorted 19th century Illustrated Newsprint pages including Harper’s Weekly, Frank Leslie’s Illustrated Newspaper, and others, 28 items total. 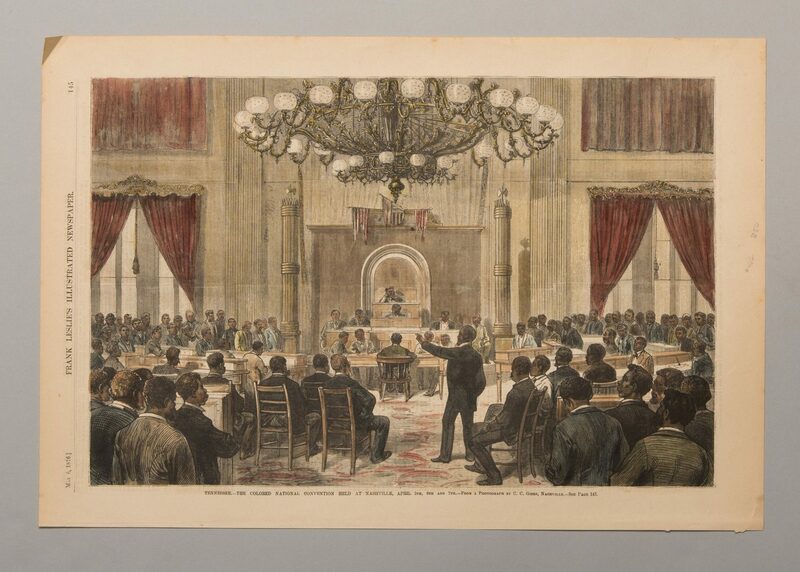 1st-15th items: Fifteen newsprint pages illustrated with wood cut engravings, most with later hand coloring, from “Harper’s Weekly”, ranging in date from January 8, 1859 to July 3, 1897. 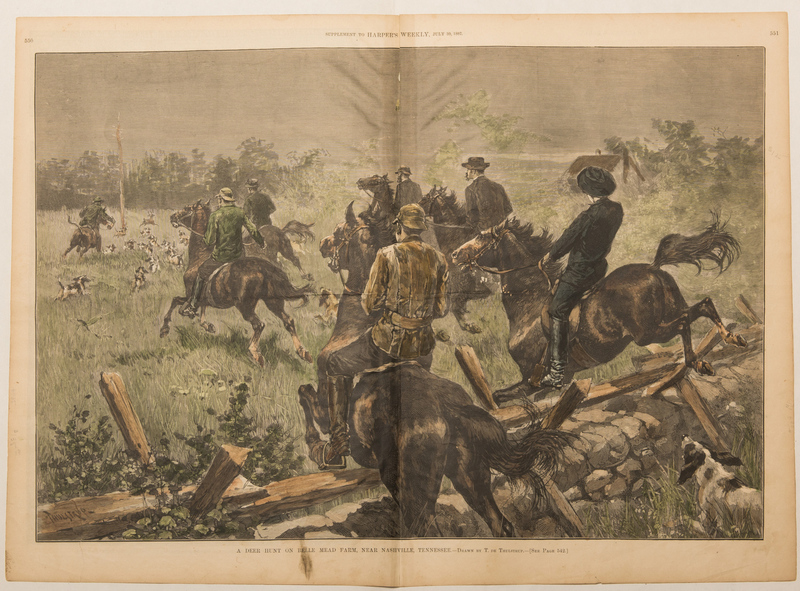 Newsprint pages depict scenes primarily related to Nashville, Tennessee including three pages from the Civil War, one page documenting President Grover Cleveland’s Goodwill Tour of 1887, one double page spread from “The New South”, supplement to Harper’s Weekly, featuring “Sketches In and Around Nashville, Tennessee”, drawn by Charles Graham in 1887, and two pages with images from the Tennessee Centennial and International Exposition in 1897. Text pages en verso. One page mounted to matte. Sheets approximately – 16 1/4″ x 11 1/2″ W. Matte – 17 7/8″ H x 12 7/8″ W. 16th-25th items: Nine newsprint pages illustrated with wood cut engravings, most with late hand coloring, from “Frank Leslie’s Illustrated Newspaper”, ranging in date from July 16, 1859 to June 2, 1883. 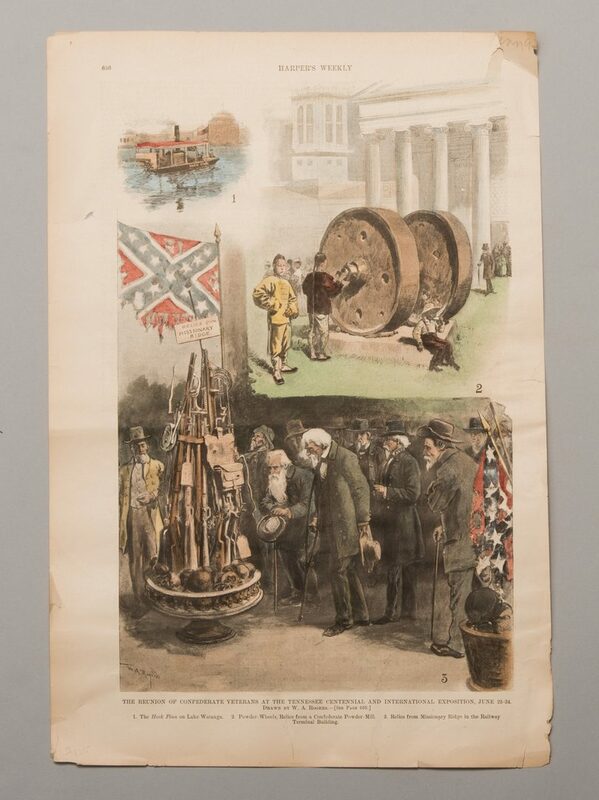 Newsprint pages depict scenes primarily related to Nashville, Tennessee including a fill page spread of “The Chatham Artillery Company…at the Hermitage, Jackson, Tennessee” in 1859, one page with illustrations documenting the Great Fire at Nashville, Tennessee in 1865, one full page spread of The Colored National Convention held in Nashville, Tennessee, April 5th-7th, 1876, and one full page spread depicting a procession to celebrate the Centennial celebration of the settlement of Nashville, Tennessee, from sketches by Walter Goaters in 1880. Text pages en verso. Centennial page mounted to matte. Sheets approximately – 15 1/2″ H x 10 1/2″ W. Matte – 14 1/4″ H x 16 1/2″. 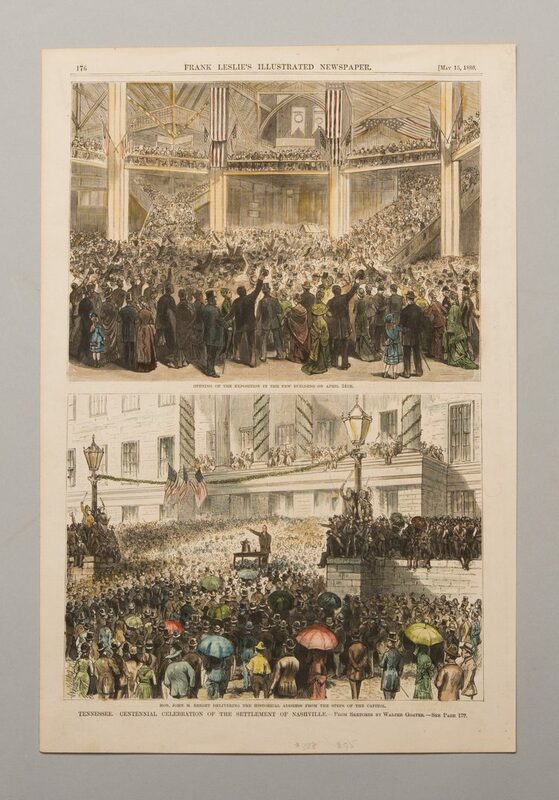 26th-28th items: Three newsprint pages illustrated with wood cut engravings, two with later hand coloring, from “The Illustrated London News”, “Illustrated News”, and one from an unknown newspaper, ranging in date from August 6, 1853 to August 9, 1862. Newsprint pages depict scenes primarily related to Nashville, Tennessee including one front page with representation of “The Civil War in America : Cottonburners in the Neighbourhood of Memphis…” in 1862, one page with illustrations from around the Nashville area, and one cut down image of the Livingstone Missionary Hall at Fisk University, Nashville, Tennessee. Text page en verso of Civil War engraving, text column included with Fisk University engraving. Two pages mounted to mattes. Sheets range in size from 5″ H x 6 5/8″ W to 15 3/4″ H x 10 3/4″ W. Mattes range in size from 8 1/2″ H x 10″ W to 11″ H x 14″ W. All items mid/late 19th century. Provenance: Collection of Charles and Ann Wells, Nashville, Tennessee. CONDITION: 1st-15th items: Pages exhibit toning, foxing, tears, to be expected from age. 16th-25th items: Pages exhibit toning, foxing, tears, to be expected from age. Chatham Artillery Company page heavily toned and crumbling around edges. 26th-28th items: Pages exhibit toning, foxing, tears, to be expected from age.